The SCAA is the trade association for the specialty coffee industry. Specialty coffee is grown in the world's most ideal coffee-producing climates and prepared according to exacting standards. One of the SCAA's primary functions is to set the industry's standards for growing, roasting and brewing. Members of the SCAA include coffee retailers, roasters, producers, exporters and importers, as well as manufacturers of coffee equipment and related products. Fair Trade Certification empowers farmers and farm workers to lift themselves out of poverty by investing in their farms and communities, protecting the environment, and developing the business skills necessary to compete in the global marketplace. 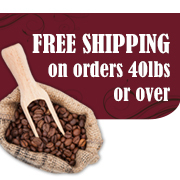 KMO is registered with Transfair USA as a Fair Trade Certified Roaster. A set of national standards put in place by the U.S. Department of Agriculture that mandate food labeled "organic" must meet, whether it is grown in the United States or imported from other countries. After October 21, 2002, when you buy food labeled "organic," you can be sure that it was produced using the highest organic production and handling standards in the world. Organic food is produced by farmers who emphasize the use of renewable resources and the conservation of soil and water to enhance environmental quality for future generations. Organic food is produced without using most conventional pesticides; fertilizers made with synthetic ingredients or sewage sludge; bioengineering; or ionizing radiation. Before a product can be labeled "organic," a Government-approved certifier inspects the farm where the food is grown to make sure the farmer is following all the rules necessary to meet USDA organic standards. Companies that handle or process organic food before it gets to your local supermarket or restaurant must be certified, too. Shade grown coffee plantations play a key role in the conservation of migratory birds that have found a sanctuary in their forest-like environment. The Smithsonian Migratory Bird Center encourages the production of shade grown coffee, and the conservation of migratory birds, through its "Bird Friendly®" coffee program. The Smithsonian National Zoological Park has recognized KMO as a Bird Friendly roaster. NJDA serves New Jersey as a catalyst in the development of a sustainable organic agricultural system; educates diverse audiences about the significance and meaning of organic practices for food and the environment; helps organic and progressive conventional farmers build and maintain sustainable operations; and offers USDA-accredited third-party certification to organic farms and processors. SWISS WATER® Process is a taste-driven, 100% chemical free decaffeination process that delivers coffee that is 99.9% caffeine-free while protecting the unique origin characteristics and flavor. Kosher Supervision of America is a not-for-profit Kashrus agency recognized by rabbinical associations throughout the world. KSA is the largest, recognized and accepted, Orthodox kosher certification agency based in the western United States.